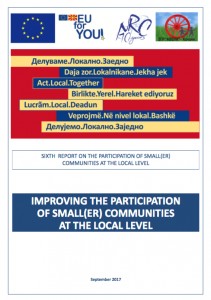 This report is prepared within the framework of the project activities “Improving the participation of small(er) communities at local level” with the support of the Delegation of the European Union and INSOK. The report covers the changes that occurred with the signing of the Ohrid Framework Agreement. Decentralization of power from central to local level as a key element in promoting and protecting the rights of non-majority communities. Law on the promotion and protection of the rights of members of communities that are less than 20% of the population. Establishment of the Committee and the Commission for Inter-Community Relations, respecting the principles of non-discrimination and equitable representation. The political context and the involvement of the members of the smaller communities in five municipalities: Kumanovo, Prilep, Bitola, Kocani and Tetovo.